Purple cauliflower was on sale at Whole Foods so I bought it. Tastes exactly the same as white, looks less appetizing when cooked, supposedly has a very slight nutritional edge. Today’s Piglet review by Michael Twitty weighing the merits of Ruth Reichl’s My Kitchen Year against Hot Bread Kitchen by Jessamyn Waldman Rodriguez is perfection. The writing is funny and vivid, but also 100% sweet and positive, which one could not say of Ari Shapiro’s review yesterday nor, ahem, my last post. Twitty presented this as a tough contest between two superb books and didn’t at any point go negative. Big hearted and gracious. I commend him. I have a copy of Hot Bread and look forward to digging into it. I’ve already cooked extensively from Reichl's bright, companionable book (Twitty: "an incredible braid of her Twitter poetry and recipes she loves"), which I regularly pull out when I don’t know what to make and it's 5 p.m. I trust Reichl’s recipes will be practical and tasty and that I might already have all the ingredients in the house. Sunday night's cauliflower pasta (anchovies, raisins, olives, cauliflower) is just one example of a last-minute Reichl feast. On another subject, I’ve now tackled a handful of recipes from Meera Sodha's Made in India, most of which are very good. My favorite is the cauliflower, cashew, and pea curry, a simple, rich, substantial “doable on a weeknight” dinner. Sodha's spinach with black pepper, garlic, and lemon is also terrific. 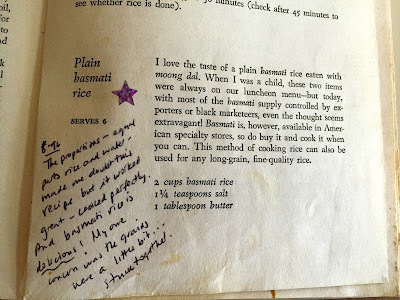 I have tried Sodha’s method of making rice and it works beautifully, as Sadie Stein noted in her review, but I prefer my old way, the Madhur Jaffrey way, which yields less oily, fluffier rice. Recipe at the bottom of this post, in case you’re interested. The only miss was the Gujarati potato curry which was exceedingly dry. It calls for a 7- ounce can of plum tomatoes. I don’t even know where you buy 7-ounce cans of tomatoes. I put in a whole 14-ounce can of plum tomatoes and the curry was still too dry. Much as I like the particularity of the exotic recipes in this book, I think that when it goes up against J. Kenji Lopez-Alt’s Food Lab in the next few days, Food Lab should win. I think of Food Lab as the Revenant of this crowd of cookbooks, the biggest, most male, and most ambitious and that therefore it should absolutely win. Kidding. That isn't why Food Lab should win, though I do sort of think of it as The Revenant of the bunch. It should win because unlike The Revenant, Food Lab is a true magnum opus, a singular work packed with Lopez-Alt's vast cooking experience, contrarian sensibility, and hard-won, useful data. The recipes are there to illustrate general principles making them at first glance somewhat generic, and this might lead the judge to choose Made in India, which is full of seductive and unique dishes. We shall see. I'm pulling for Food Lab, though Made in India is pretty great, too. Now we know that at least one good thing came out of the Iraq War. It softened one woman’s heart, broadened her mind, and led circuitously to the publication of a very fine book that may soften other hearts and broaden other minds about a culture unfamiliar to most Americans and unnerving to more than a few. Campbell rediscovered the inner peace of her Iraqi sojourn again in Oman, where she now lives. This extraordinary book is a love story of a person for a place. Of a woman for a culture we don’t think of as particularly hospitable to Western women. I had to look up Oman on a map. I had to google "Muscat" to get a mental picture of the capital city. I have a lot to learn. Apparently I made this for the first time when I was pregnant with Isabel. In the note I complain about the rice sticking together, which probably means I rushed the rinsing process. 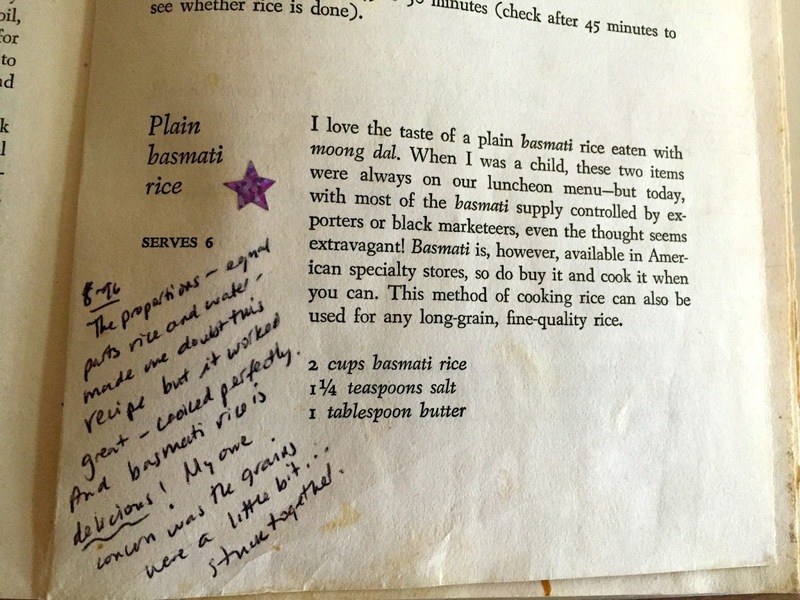 Basmati rice, Madhur Jaffrey's way. I have made this recipe a hundred times. The little 1973 book opens right up to the page. The salt is different in my version below because I use kosher. I don't always measure the salt. A big pinch is ok in both places. I don't measure the butter either and usually put in more to be sure it is extra buttery and delicious. Rinse 2 cups basmati rice in running water, rinse it really well. Soak for a half hour in 5 cups water with 1 teaspoon of kosher salt. Drain. Melt 1 tablespoon butter in a saucepan, add rice, stir to coat the grains. Add 2 1/4 cups water and 1 teaspoon of kosher salt. Bring to a boil, cover, lower heat as much as you can, and cook for 20 minutes. Lift lid. Fluff rice gently with fork. Cover and cook another 10 minutes. If you leave the lid on after it's done cooking, the rice will hold for a quite a while at a nice, warm temperature. I usually start cooking the rice about an hour before we eat. Serves 6. Laughing so hard at the idea of Food Lab as The Revenant. Such an apt description. It sums up my feelings about both: fine but not thrilling; I'm impressed but not captivated. I am not captivated by Food Lab either, but I like it. I thought Twitty's review was lovely. I knew Hot Bread Kitchen was going to win, but he was, as you say, so generous and kind throughout. I have Made in India and Madhur Jaffrey's new book (Vegetarian India) waiting for me on hold at the library. My copy of Jaffrey's Vegetarian World-of-the-East Cooking is falling apart I've had it so long and used it so much, so I'm curious about the new one. My not-so-secret secret is that despite having lived in India, I am still not great at making Indian food. Every time I go and rhapsodize about the dal at my friend's house in Delhi, I swear I am going to figure out how to replicate it at home, but I never have (at least not yet). As for The Food Lab, I've been dipping into it. My attempt at soft-boiled eggs his way failed miserably, but I can see the possibilities for poached eggs. And the French Toast I made (via Serious Eats) was fantastic. (Clearly, I haven't made it past the breakfast section.) I don't eat or cook meat, so I'm not sure it's worth it to buy, but we'll see as I get further along. I borrowed my sister's copy of Food Lab and broke down today and bought it. I'll check out his Serious Eats french toast -- my big breakthrough on FT came when I read Molly Wizenberg's recommendation to fry it in oil. I thought Ruth Reichl's book was fine but not great; I think she's got a lot of residual goodwill (well-deserved!) from Gourmet's abrupt shuttering. Most of the recipes in her book didn't appeal to me, but I can see how they're appealing generally. The thing I really couldn't get around is that the dang book doesn't lie flat, which for me is a deal breaker in the kitchen. I really enjoy Kenji Lopez-Alt's deep dives into food but am surprised that The Food Lab has made it this far, just because it doesn't seem like the kind of cookbook that advances in the Piglet; still, it's only the quarterfinals, right? It could still get knocked out by some baking book. Thanks for another wonderful entry. The Piglet wouldn't be nearly as much fun without you sideblogging it. That book's failure to lie flat is a nightmare. How did that happen? Kenji is such a "guy" cook. BTW, I loved the Yuban post on FB. I love Reichl's book, and Jaffrey's, of course, but haven't seen the others yet--my loss. I've been dwelling on the last post, as in, Jesus, what if Swanson reads this? I am a reviewer for PopMatters.com (not a sell, relevant to what am I about to say). Early in my tenure, I blasted a terrible book. The author responded childishly, leaving rude messages on my then-blog, nasty emails, etc. She never published another book, but I learned my lesson. Yes, the book was terrible, its author foolish. But I truly hurt her. Now I find critical reviews the hardest to write. That sounds like a tough experience, getting those emails and knowing you hurt someone. I find critical reviews very hard to write and I obsess over them. (I obsessed over the Heidi Swanson post.) I wrote many critical reviews when I was a full time book critic and I regret the tone of some of them now. I could have been far more generous. Having said that, I tried to be fair to Swanson and focus on her work, not her personally. If you think something about a work under discussion, especially if it's by a popular, successful author, you need to be able to say it. I think authors should avoid seeking out what people say about their work unless they have very thick skin. In other words, no google alerts, active avoidance. That's what I did when I wrote a book, but I seem to be in a happy, ignorant, cowardly minority. Food52 comes after your blog in my bookmarks list, so I have to be sure to skip ahead to the Piglet before I read you. I was captivated by Twitty's review and went to buy both books until I remembered that I'm 16 days out from doing an elimination diet to clear up some health issues and I know anything from Hot Bread will be verboten. Well, there are a lot of non-bread items in Hot Bread -- and when the elimination diet has worked its magic, perhaps you can loosen your restrictions a bit? Michael Twitty's review was generous and lovely; I'll be taking 'My Kitchen Year' out from the library, as a result of it. I've had less luck with 'The Hot Bread Kitchen,' preferring old recipes to some of theirs, but I love the story of the bakery and applaud its ethos. I'm still trying to work up enthusiasm for 'The Food Lab,' despite being a huge fan of Kenji's via Serious Eats. His palate is the closest I've ever found to my own, but I'd been hoping for 'The Food Lab' to be more international in scope, rather than sticking pretty closely to standard American fare. I'm sure I'd learn a ton by cooking through it, but I'm not very interested in the results. Regarding my current obsession, 'The Food of Oman,' I'm so happy you like it! It really is an extraordinary story and a very fine book, full of delicious recipes. I spice it up a bit, and downplay the cinnamon, but am having a wonderful time trying out combinations that are often new to me, despite being familiar with its cultural components. This weekend, a range of flatbreads for the freezer. I'm currently making the caramelized beef dish. We shall see. Have you looked at the recipe for aseeda? I am fixated on the idea of aseeda, but the quantity of sugar looks suspiciously large. I tried to drink one of the condensed milk teas earlier for my afternoon treat, but it was too sweet. Yummy, but not a Western taste, such sweet, thick tea. No, I'll be skipping the aseeda, as it's written :) I'm deficient in the sweet tooth department, so the combination of that much sugar with that much rose water is distinctly unappealing. Possibly with the sugar dialed way down and a lesser amount of orange water swapped for the rose water. It certainly is an appealing looking dumpling, with a very interesting technique. Do you think it's hollow inside, or is it thick stodgy dumpling all the way through? From the description, it sounds like the latter. If so, it looks like the ever-useful Danish dough whisk would be a must-have in making it. It's the only thing that can stir through my dad's favourite oatmeal-tart cherry cookies without making me wish the texture was the same if I used a mixer. As for the teas, I enjoy their flavour, but have to tone down the sugar for those, too. They're almost viscous, they're so sweet. Although a nice syrupy ice-cold mint tea on a hot, hot day -- perfect! If you find the caramelized beef stew dry, the sweet and spicy lamb and date stew on the next page is quite nice. It's just the right amount of sweet, especially with a couple of teaspoons of ground coriander added to balance out the dates and warm spices. Viscous is the perfect word for that tea. I was wondering if this beef would be dry. I'm making the little cardamom fry breads and the coconut spinach, so that should provide soupiness. Have you tried either of those? The lamb looks like a lamb-date tagine I made a few times from Claudia Roden. Really delicious. The cardamom fry breads are great -- light, airy, and a touch sweet, rather Swedish in flavour because of the cardamom. I haven't tried the spinach yet, but the Zanzibari savory mashed green bananas (p. 130) were oddly compelling and good for scooping. Those fry beds were amazing. And the spinach went perfectly. I didn't find the beef too dry, but I didn't cook off all the liquid. Best dinner I've made in 2016 by far. Well, that's my dinner decision made for Saturday, then! I have Food Lab.. 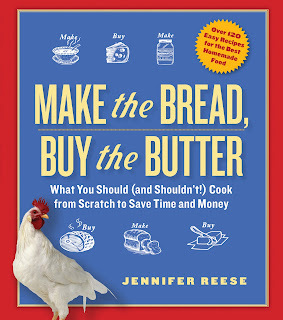 I think of it more as a reference than an inspiration style cookbook. I love Indian food so have checked out the Made In India..but today's review of the two - I thought was terrible. It wasn't about the food or the results but seemed more about personality. I made the mistake of making a comment on it.. and now am getting a ton of email notifications of others comments, lesson learned there! I always enjoy your posts. Thanks for this! I watched and thought her son did an excellent job. She was a fascinating woman, and I miss her films. Have you had a chance to look through Indian Kitchen by Maunika Gowardhan. I loved the book and even went so far as to list the MANY spices etc to try to get my hands on. But alas....The book went back to library it was just toooo much to have to deal with. But it was a good read. I made something out of it....and it was really good. I just hate to admit I can't for the life of me remember what it was. Buut it waaaaas very good.